We have made several bird houses from gourds. They are easy to make and fun to decorate. Tree Swallows love them. After hanging the Gourd house's back up every Spring we put white feathers out and watch the little acrobats swoop down and get them, they are soon chased by another Swallow wanting the treasure for their own nest. A pair will work very hard to build their nest. 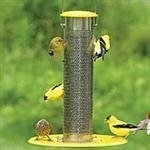 It is a joy to watch and then to see their little heads popping out looking for food is also very entertaining. They soon take flight returning to the nest at night for a couple weeks and wishing for free food from their parents. Sometimes the pair will hatch a second brood out. 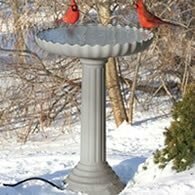 The hole should be 1 1/4 to 1 1/2", they should hang protected from direct sunlight 5 to 15' high (ours like them higher) and facing about east. 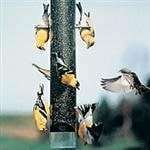 Look for more hanging tips on this wonderful site. 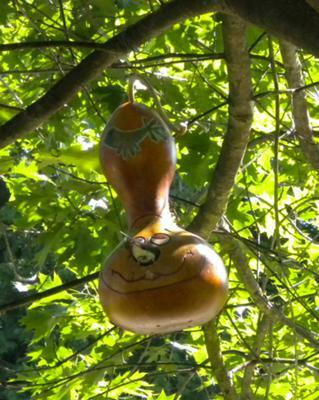 HELP -- All of the paint I sprayed on my 5 gourd birdhouses has peeled off. The first time I sanded the outside of the gourd then I sprayed with an acrylic paint and then I gave them a coat of polyurethane. They were beautiful until the first rain which made almost all of the paint peel off. 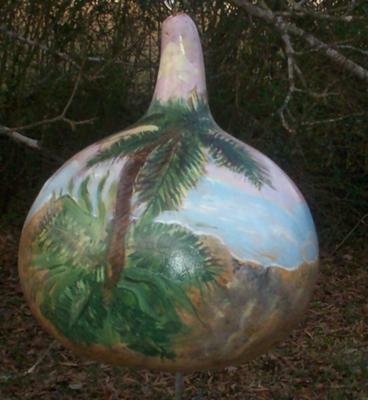 After I peeled as much of the remaining paint off, I tried just spraying the bare gourd. That too peeled off. Can you help? Thanks. Join in and write your own page! It's easy to do. How? Simply click here to return to Birdhouse Invitation. I started out by making some planters out of gourds.To my surprise, the one I had in front of my window suddenly became of great interest to some Wrens. I had to stop watering the little plant of course, but the problem was, every time my cat would come near, the Wren would start screaming at the cat, really making an exhibition of himself! If he had stayed quiet everything might have gone very nicely, but of course the cat was led right to where the Wren wanted to nest and it just didn't happen. 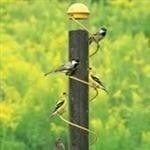 Now I am really trying to attract birds. I've made several gourd nests and this time I'm hanging them out of reach of naughty cats!! I live in Cuernavaca, Mexico. While it's not officially Spring yet here, I'm busy making and hanging gourds all over the place. Someone said they are a wonderful, light, beautifully shaped and textured. I just love them . I have decorated them so far with rough string, beads and shells. I would like to paint some designs on the next ones. I'm always in such a hurry to see them finished! Hope the Wren might decide to try again. 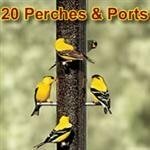 It would be lovely if some other family of birds might be interested too!!! The Nova Scotia Talent Trust in Canada is looking for Felicity Rainnie, artist and daugther of painter Hedley Graham James Rainnie, who married Audrey Ursula Beeching. The NSTT got a Portrait of Portia White painted by Hedley Graham James Rainnie donated and we are looking for relatives of the painter to ask for permission to print the portrait to a postcard to our supporters. Well I'm delighted to report that after having made about eight Gourd Birdhouses and doting them around the outside of my house, too high for my two naughty cats to reach this time! and having waited months for something to happen. Two days ago there was a Wren at one of them with a beak loaded with nesting material! I can't tell you how happy I was to see this perky little Wren jump in and out of my birdhouse arranging things. I have hung the birdhouse just outside my studio window so I will be able to watch a good deal. Unfortunately there is a glass window between her and me, but I'll try my best to get good photos. We had 3 sets of babies this year. 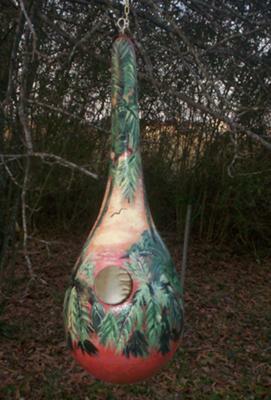 This was the first year for my gourd birdhouse. The male sure did decorate it up nice before the female came. Three sets of babies! 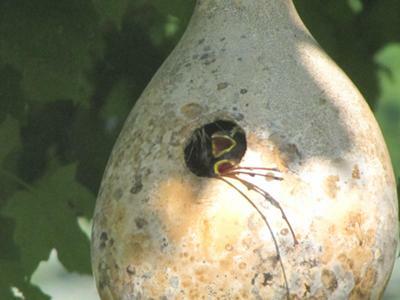 Gourds make excellent birdhouses. 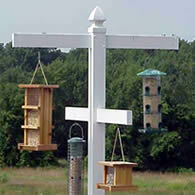 Wrens, Purple Martins, Tree Swallows and others will use them provided the opening and placement is right. 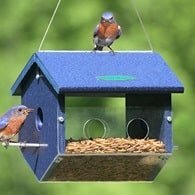 Another thing you might consider for your gourd birdhouses are access ports. 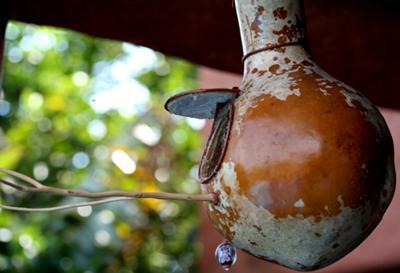 Manufacturers make a lid that can be adapted to your gourd for easy cleaning. 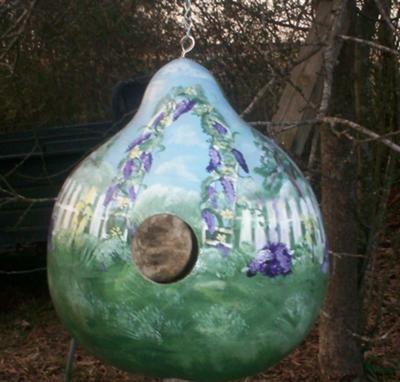 Over the past few years I have found solace and peace painting gourd birdhouses. 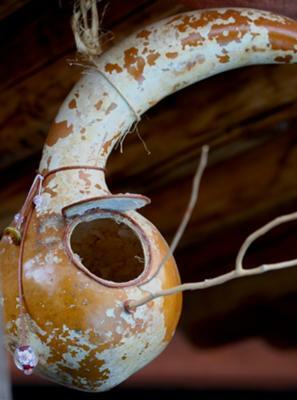 Every birdhouse is different just as the gourd since it is grown by nature. 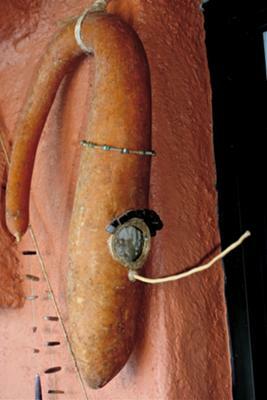 After the gourd is cleaned scrubbed and prepared I then begin the creation of my artwork! Little did I know when finishing my creation with coats of varnish and hanging them from my apple tree to dry that their vibrant colors would be the main attraction for the neighborhood hummingbirds. As I turned to walk into my house, I heard a faint pecking noise, then another, then another, and as I turned there were hummingbirds gathered all around my hand painted gourd birdhouses trying to feed off the artwork in which I had just painted. There is beauty in nature no matter how it is created. A lot of my birdhouses I have given to nursing home patients, shut-ins, etc. 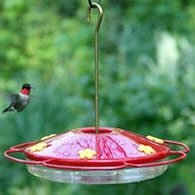 and go back to hear their stories of how they have enjoyed watching birds of all kinds flock to find nests, feed off the vibrant colors, or just to visit out of curiosity. The stories of the mothers that have gathered on their sofas with their children to watch the new babies learn to fly, the shut-ins that sit by their window and occupy their time as their feathered friends visit, and the nursing home patients that are reminded daily of a God that has created something so beautiful and delicate as a little bird, my peace and solace has now become theirs. Your houses are lovely! 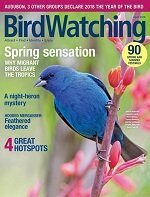 Such inspiration for bird lovers, and how generous and thoughtful to share them where they will be so appreciated! 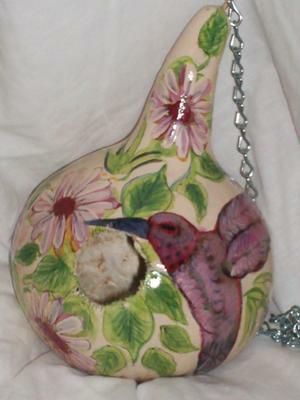 Your painted gourds are beautiful works of art! I think your sharing them with others who have need, is what makes them glow with special beauty! Thank you so much for sharing your story and your lovely works of art!